Sorry, couldn’t resist. Precision of language, folks. Gale complains about #Katniss’ distracted kiss. I personally wouldn’t mind what she was thinking about. The rebels crack the #Nut, much to #Katniss’ disapproval. The beginning of the schism between Katniss and Gale. A little play on words there. Reminds me of Duck Dodgers’ Disintegration Pistol which would…disintegrate. #LooneyTunes. “History doesn’t stop to celebrate.” Does it stop to mourn? We do every year on September 11th and December 7th. There’s a whole section of the book where Katniss has to do extensive training in order to join the team. Sadly, none of those scenes appear in the movie. In that 50s sci-fi movie they were called pod plants, but close enough. Snow does have him trained pretty well. Before you brand me as a heretic, know that this is a witticism, courtesy of Bob Phillips. Paul was actually a tentmaker, but the joke maintains that he was a baker because he went to Philippi (Fill A Pie). #PewHumor. Apparently the Capitol has plenty of oil to waste. I guess it’s Holo-Oil, created by the Gamemakers, but still. Interesting word choice since Snow frequently plucks roses from his garden. Coin cuts in on Snow. How wud! No, they don’t dance together in the movie. That would be creepy. Rest in a sewer? Don’t know that I could. Unless I had nose plugs. There’s a sound in the sewer tunnel. Must be #Gollum creeping about. Kind of like the speedy zombies in I Am Legend (2007) or World War Z (2013). #Tigress is on loan to #Panem from the #ThunderCats. Correction: Tigress is from Kung Fu Panda, Tygra is from the Thundercats. “They chose you.” Then they chose death. Snow’s “our way of life” speech is frighteningly relevant to current events. #ParachuteBombs Once a symbol of hope, now an instrument of death. Color me cynical, but I wouldn’t be anywhere near one of those parachutes when it landed. I think I counted three visits to the hospital. This story device, which is presumably designed to produce pathos in the viewer, gets worn out from overuse. “These things happen in war.” Especially when Snow’s finger is on the button. A symbolic Hunger Games? Have we learned nothing? Coin signs her own death warrant at this point. Snow’s execution...you can hear a Coin drop. “GET OUT!! !” Poor cat’s gonna have #PTSD. Although, I’ve never seen a cat just sit there when objects are hurled at it. “No one ever wins the games.” Not even the #Victors. Especially not the winners, because they have to live with the guilt from all the people they’ve had to kill in order to survive. “Much worse games to play.” #Katniss has different arrows in her quiver now. This world stands in stark contrast to the bombed out dystopia featured throughout the series. These scenes seem to suggest that there’s hope for humanity. #HappyEnding. Final analysis: an adequate, if not spectacular, series capper. The first two were really good, the last two were mediocre. Should’ve been a trilogy. It’s a shame that The Hunger Games ended up as an average movie series since it had such potential to be great. Rating: 2 1/2 out of 4. The perfunctory plot and lack of action make this an unsatisfactory conclusion. The trend where the final book of a series is turned into two movies needs to take one of Katniss’ arrows straight through the heart. Instigated by the Twilight and Harry Potter (and later by The Hobbit, which is three movies for one book) franchises, the end result in each case has been a weak and watered down conclusion. Obviously the rationale for milking more movies out of a book series is financially motivated, but any art extracted from the source material is suffering at the hand of avarice in these four movie trilogies. Mockingjay 1 was a middling effort that merely set the table for this series finale. Maybe it’s due to that weak lead-in, but this final Hunger Games film is a drab, lackluster affair, with a dearth of action sequences, insipid character scenes and a ho-hum resolution. It’s a shame that Jennifer Lawrence’s considerable talents were wasted on this uninspired rendering of Suzanne Collins’ novel. Other A-listers were also underserved here: Woody Harrelson, Elizabeth Banks and Stanley Tucci have maybe a half dozen scenes between them. Also, Donald Sutherland (President Snow) and Julianne Moore (President Coin), as post-apocalyptic power brokers on opposing sides of a coup, do their utmost to animate their cardboard characters, but unfortunately even fine acting can’t elevate the movie’s mediocre writing. It’s truly sad that this underachieving effort will go down as Philip Seymour Hoffman’s final film credit. With all the quality work he did before his untimely passing in early 2014, it’s a shame that this film will be his last impression on future audiences. Additionally, how ironic is it that Hoffman’s acting career, which was largely devoted to independent and arthouse pictures, should culminate with a commercial blockbuster and that today’s youth will probably only remember him as Plutarch Heavensbee in The Hunger Games films? As for the story, everything feels rushed, expedient and contrived in Peter Craig and Danny Strong’s screenplay. When the Nut is blasted by the rebels, we see the explosions over Katniss’ shoulder off in the distance while she’s in the middle of an important conversation. Here was an opportunity to create a really amazing action scene but it’s thrown away as a non-event, and worse still, upstaged by chatting characters. It’s bitterly ironic that even though there are plenty of character moments in the film, there’s very little characterization…an important distinction. We lost some good character interactions during the training sequences, which failed to appear in the movie, presumably because they would’ve taken up too much screen time. 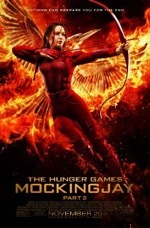 The simmering love triangle between Katniss, Peeta and Gale (which is an obvious echo of the Bella, Edward and Jacob triad from the Twilight series) comes to a full boil in this movie, but oddly, Katniss’ conflicted choice is made academic by the poor decision of one of her suitors. Her selection is made in an instant, which cheapens the moment and is a severe letdown after the buildup over the last three movies. Like the previous films, the final chapter of The Hunger Games flirts with a message, but doesn’t really deliver on the promise of a well considered, dystopian cautionary tale. The perfunctory plot (which hews too closely to Collins’ novel) takes us on an expected journey to a predictable final confrontation and a standard, even passé, resolution. The movie’s Jane Austen style ending will likely leave some spectators bewildered and others angered. This bucolic dénouement was a gutsy choice and even though I’m not averse to it personally, I can see where others might take issue with it or outright mock it. So, is this film worthwhile? Depends on how you like your entertainment. For me, the movie left me hungry for a more substantial and meaningful final act to an otherwise entertaining series.